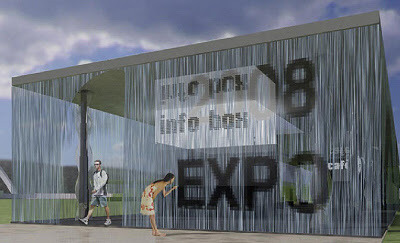 The Digital Water Pavilion, an interactive structure made of digitally-controlled water curtains, will be built at the entrance to the 2008 expo in Zaragoza, Spain. It features a tourist information center, a cafeteria and an exhibition on the 'digital mile' project, surving as a showcase for the Zaragoza of the future. Here's an impression of what the Digital Water Pavilion is going to look like.